An American icon in the RV industry, Airstream has recently celebrated 80 years of “Airstreaming” history. Part of that celebration included upgrades on the company’s popular Class B conversion vans, the Interstate and the Avenue touring coaches. 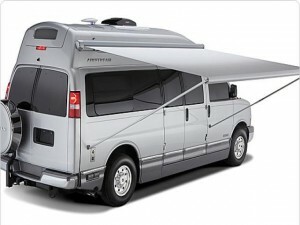 In particular, it is the 2013 Avenue that continues the Airstream pride of quality and styling. It is designed with all the best materials, such as ultra-leather seating and customized decors to provide the feel of comfort and luxury in a home away from home. The Avenue is built on a Chevrolet 3500 Series Express chassis, very powerful with a L96 V8 engine and 6L90 transmission. It has a gasoline tank of 31 gallons and a freshwater tank of 34 gallons. The Avenue’s towing capacity is almost 8,000 pounds and the gross vehicle weight is 9,600 pounds. Currently it is the only Class B motorhome that is furnished with side-impact airbags. The 2013 Avenue has three floorplans; the Avenue Lounge, the Avenue Lounge Wardrobe and the Avenue Suite. The overall length is 21’ 1” and the overall height is 9’ 1”; the interior height and width are both 6’ with an overall width of 7’ 6.4”. The Avenue sleeps two comfortably and can seat up to seven. Features include a kitchen with dual sinks and stainless steel appliances, a 3.1 cu. ft. refrigerator, and a private bathroom. The Avenue has a 19″ flat panel TV and a lounge area that can convert into a bed for two. You will also stay comfortable with its 13,500 BTU air conditioning unit and a 16,000 BTU furnace. We found a MSRP of $102,000.00, but dealers are already offering lower prices depending upon amenities and features. Our Motorhome Comparison Guide provides many more details on this very popular, longstanding manufacturer. Buy the book now and you can use the many reviews and tips to see if this is the right Class B motorhome for you.